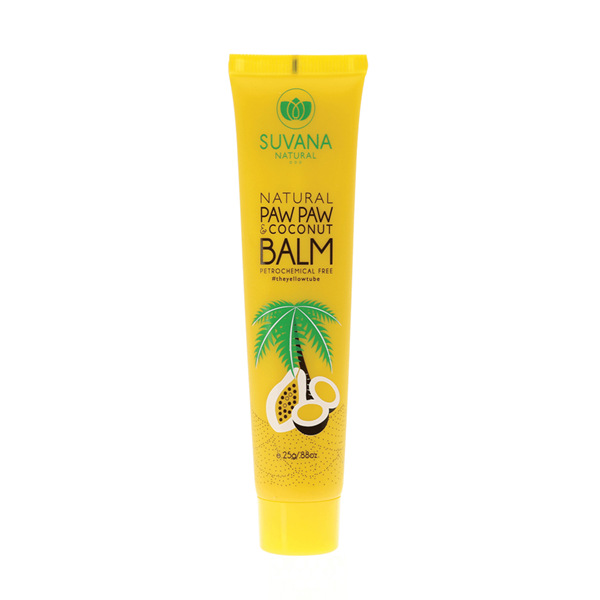 Suvana Beauty Paw Paw & Coconut Balm (25g) is an organic, natural skin balm and soother without the petroleum jelly! 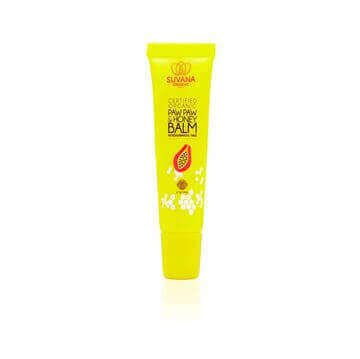 This versatile organic balm is a hand bag must have item and can be used for many skin issues. Use it as a lip balm to help heal and relieve dry chapped lips, as a nappy rash balm to soothe and heal skin as well as on cuts, scratches and dry elbows. It works wonders on most skin ailments! Contains main active ingredients Paw Paw, Coconut, Cocoa butter and Jojoba for soft, smooth skin! 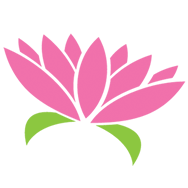 Ricinus Communis (Castor) Seed Oil, Hydrogenated Soybean Oil, Cocos Nucifera (Coconut) Oil, Theobroma Cacao (Cocoa) Seed Butter, Euphorbia Cerifera (Candelilla) Wax, **Fragrance (Parfum), Simmondsia Chinesis (Jojoba) Seed Oil, Vanilla Planifolia Fruit Oil**, Helianthus Annuus (Sunflower) Seed Oil, Daucus Carota Sativa (Carrot) Seed Oil, Carica Papaya (Papaya) Fruit Extract**, Stevia Rebaudiana Leaf/Stem Extract, Tocopherol **Certified Organic Raw Materials.